Episode 92 - This is another eventful episode. Krishna & Arjun take a break and go on a leisure trip to Indraprastha, where it appears Arjun is king. Both heroes have forgotten the Gita, so Krishna recalls another dialog along the same lines, which is called the Anugita. Krishna goes home, while the Pandavas go prospecting for gold in the hills. While they are away, Parkshit is born, or rather still-born. Krishna arrives in time to make good his promise and revives the kid. When the Pandavas return with their treasure, the white horse is set loose and the Ashwamedha is begun. Arjun follows the beast across the length and breadth of India, defeating all comers and sending them as his guests to the sacrifice. 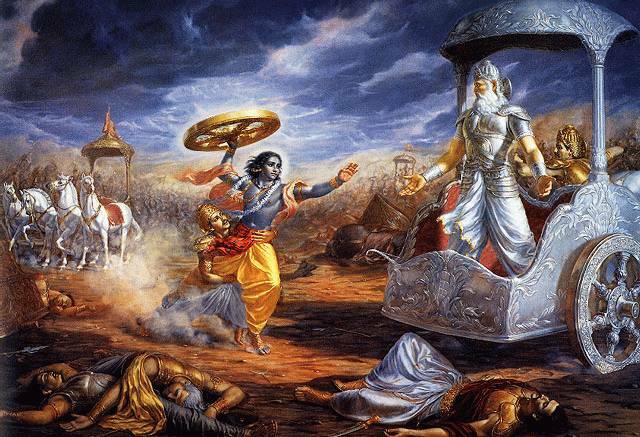 Arjun meets one of his sons, the Prince of Manipur, and gets killed & revived along the way.